I am a big fan of the serial 'Balika Badhu'. Except during the time of my working in IBM in Bangalore, I always watched the serial sharp at 8 o'clock without miss from the day it started to be on air. Now when I am in US, I still am hooked on to the serial with the same zeal and enthusiasm. The recent entry of 'Siddharth Shukla' to replace Jagya in Anandi's life has incited my interest further in the upcoming episodes. I am impressed with the fact that our serials have matured in terms of showing the heroines move ahead with their lives leaving the past behind. For all those women who have suffered the pain of being jilted by their husbands or boyfriends for another woman, let me tell you it's better that God has given you a second chance to make something good out of your life and find someone better than wasting your precious life with a wicked selfish creature. I myself have gone through a similar experience in my life, but on hindsight I feel happy and thank God that it happened because that gave me a chance to find someone so honest and loving like my husband. No one else would have been a better life partner for me other than him. Back to the recipe, the following dish can be prepared using any fish that has fewer bones, like Tilapia and Bhetki. I have cooked the dish previously with Bhetki but since I didn't find Bhetki fish available in US, I tried it with Salmon. 1) Marinate the Salmon fish with lemon juice, salt, black pepper powder and mustard powder. Refrigerate for an hour. 2) Shallow fry the Salmon fishes on both sides. Keep aside. 3) Heat butter or white oil in a skillet. Add garlic and ajwain into piping hot oil. When garlic begins to brown, add spinach. Stir cook for 2 minutes till spinach is cooked. Add salt and 3/4 cup white sauce. Mix in. Turn the heat off. 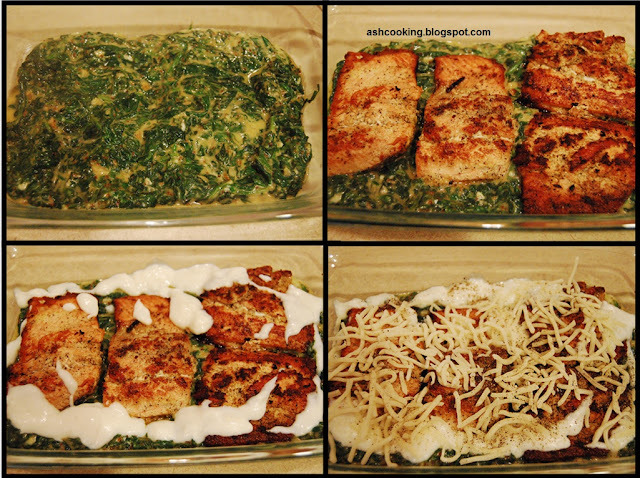 4) Now in an oven proof dish, arrange a bed of spinach mixture. Place the fried fish fillets on the bed. Spoon the remaining white sauce around the fishes. 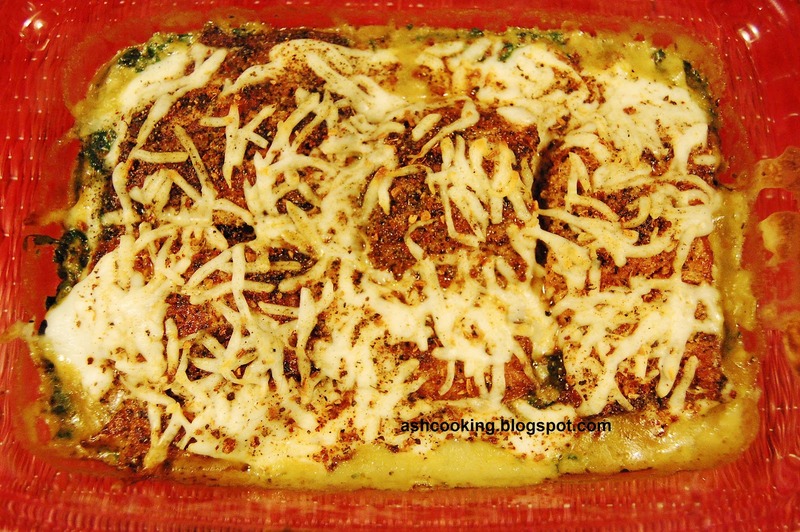 5) Drizzle grated cheese on top. Sprinkle paprika, salt and black pepper powder. 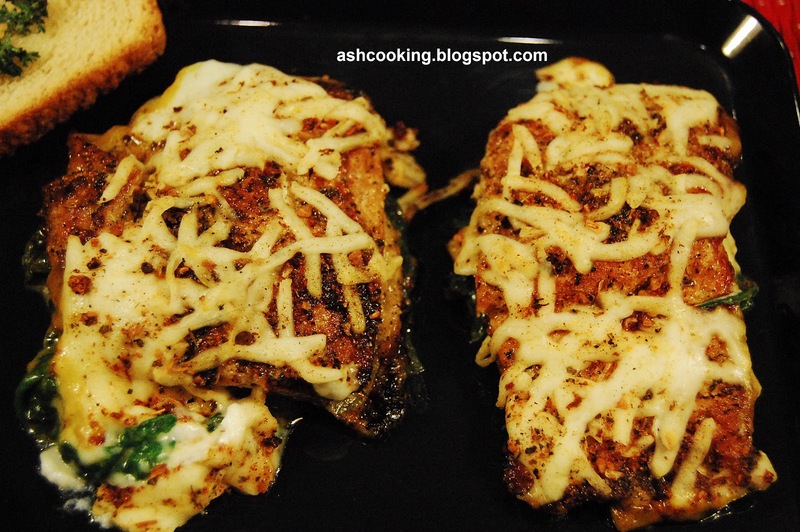 6) Pre-heat the oven at 200° C or 390° F. Bake the fishes for 5-7 minutes till mozzarella melts.